The German Luger P08 was a legendary pistol back dating all the way back to the early 1900's and is still highly regarded to this day. The Pistole Parabellum 1908 (P08) Luger was widely used by the Germans during World War I and World War II. The recoil-operated semi-automatic pistol design was patented by Georg J. Luger in 1898. This was one of the first semi-automatic pistols ever designed. Even after WWII the Luger was widely used throughout Europe by military and police but was later replaced in most cases by the Walther P38 which was cheaper to manufacture. The namesake 9mm Luger cartridge is still the most popular pistol caliber in the world. Of course the Luger's use by the Germans in just about every WWII movie ever made contributed to its fame here in the USA. 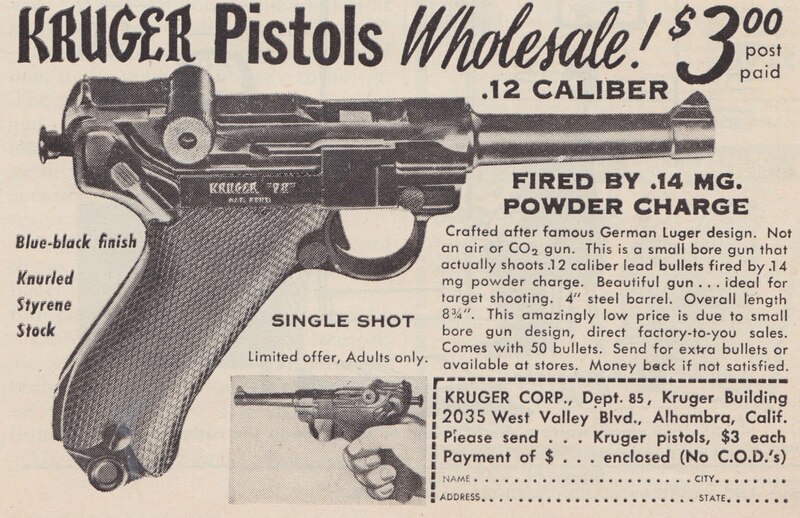 It’s only natural that an American company would have tried to cash in on the Luger name. 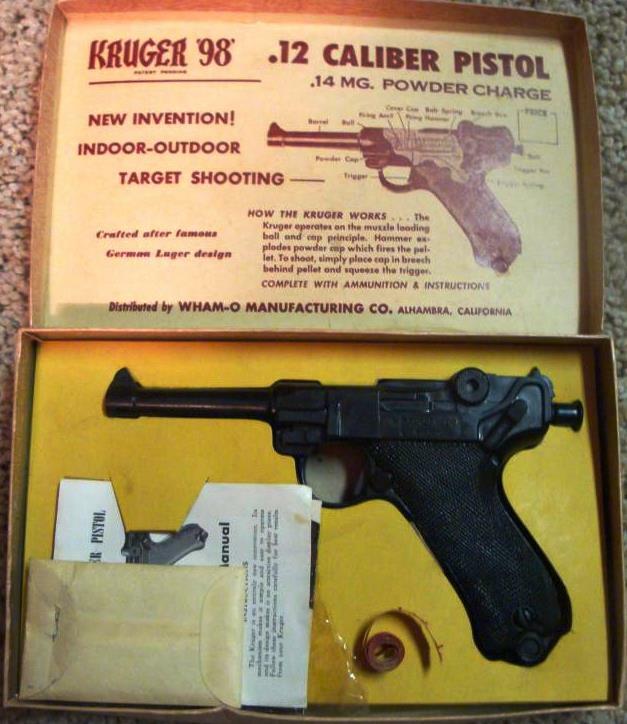 The Wham-O toy company was one of the first with their “Kruger” 98 Pistol sold mainly through mail order in the backs of comic books. Here is the original ad copy from one of those ads. Crafted after famous German Luger design This is not an air or CO, gun. 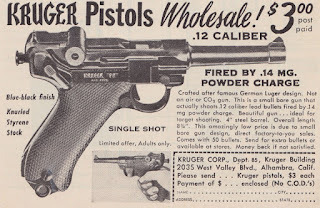 The Kruger is a small bore gun that actually shoots .12 caliber lead bullets fired by a .14 mg. powder charge. Beautifully designed—ideal for target shooting. It has a 4-inch steel barrel. Over-all length is 834 inches. This amazing low price is due to small bore gun design and direct factory to you sales. The Kruger comes with 50 bullets. Extra bullets are available direct from as or at your local store. This offer is limited. Special Mail Order price of $3.00 each. YOUR MONEY BACK IF YOU ARE NOT COMPLETELY SATISFIED. Adults only. Send $3.00 in check, cash or money order." Thousands of excited kids and gun nuts ordered these cool sounding pistols, most were sorely disappointed by what they received in the mail. First of all that .14 mg. powder charge was nothing but a standard paper cap gun cap and the .12 caliber shots were nothing more than bird shot. The caps were enough to actually send the bird shot out the end of the barrel and a few more feet if you were lucky. The guns were almost entirely plastic except for a few internal parts which quickly began to rust from the corrosive cap gun powder. The manual suggested using several caps stacked on top of each other for extra power but the cushion provided by more caps made it impossible for the firing pin to engage more than one or two. All of the problems associated with the Kruger left a sour taste in many consumers mouths. Understandably when a similar ad was placed in periodicals and papers soon after many buyers passed on another Luger wanna be. This one seemed to be another play on the Luger name this time with an R at the beginning to replace the L. But this one was a more respectable .22 long rifle caliber and cost a hefty $37.50. Of course this company turned out to be the Ruger that we all have come to trust and love. 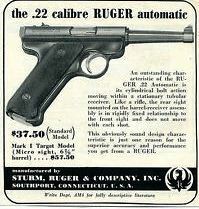 And the Ruger name belonged to the co-founder of Sturm-Ruger, William B. Ruger. Nevertheless the similarity to the Luger design was undeniable and no doubt on purpose. The Luger pistol was actually based on The Japanese Nambu Pistol design which had been greatly influenced by the German Luger and Mauser pistol designs. See this excerpt from Wikipedia ....... "Just prior to their partnership, Bill Ruger had successfully duplicated two Japanese Baby Nambu pistols in his garage, from a captured Nambu that he acquired from a returning Marine, at the close of World War II. When it came to designing their first auto pistol, Ruger decided to incorporate the looks of the German 9mm Luger and the American Colt Woodsman into their first commercially produced .22 caliber pistol (see Ruger Standard), which became so successful that it launched the entire company. 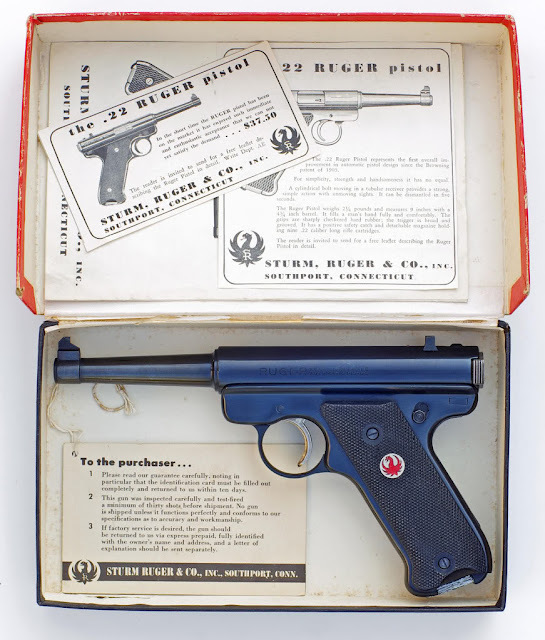 When potential financial backer Alex Sturm was shown the prototype Ruger had created, he was impressed by its sleek traditional aesthetic and its slight resemblance to the classic nostalgia-evoking Luger pistol. Eventually Rugers quality overcame any stigma associated with the Wham-o offering and everyone forgot about the ill-fated Kruger. What we were left with was a true contender that would soon come to compete with Smith and Wesson and Colt as a mainstream American Firearms manufacturer. Today the Ruger .22 Mark IV 22/45 is probably the most popular .22 automatic pistol of all time and it's name stands for itself. More info I found on Wikipedia....... "Just prior to their partnership, Bill Ruger had successfully duplicated two Japanese Baby Nambu pistols in his garage, from a captured Nambu that he acquired from a returning Marine, at the close of World War II. When it came to designing their first auto pistol, Ruger decided to incorporate the looks of the German 9mm Luger and the American Colt Woodsman into their first commercially produced .22 caliber pistol (see Ruger Standard), which became so successful that it launched the entire company. Thanks for this post. People who are really the lovers of firearm may go and join the Firearms safety training classes and get the guns of their own choice as you can easily get the license after joining these classes and avail for the desired gun or firearm. According to the Forgotten Weapons YouTube channel, Luger redesigned the C93 Borchardt pistol and that's what became the first Luger pistol. There was no mention of the Japanese pistol in the video. Thank you for your post quality articles and may be useful for many people. Shooting is many persons hobby now a days. Best pellet gun ever is best for shooting. See more here Best Scope ..